This is our second Newsletter on the Bizerte project. You are receiving it because you registerez (with an email address) for a Bizerte kit in 1/72 nd scale. the boxart shows aircraft Nr18, hull code E12, named LE GRAND COUREUR, escadrille E1, Berre, 1937. The squadron insigna is a wolf 's head. The standard Bizerte (Nr3 to 37) did get an improved hull, differing from the one fitted on Nr1 and 2, and Saigons (if we stand correct, Bizerte 1 and 2 and the two Saigon did get the same hull). 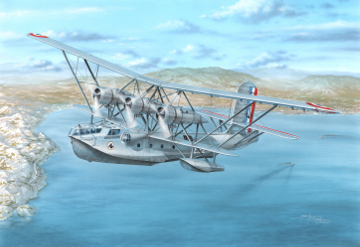 For sure, the hull is a very important (and costy) part of a flying boat, so we will very probably produce in 1/72 nd only the standard hull (Bizertes Nr3 to 37). The long canopy was used with Bizertes Nr3 to 37. Some modifications were also done on the lower wings (1, 2 and Saigons). You may register to the Bizerte book, too (special price, with the kit subscription). The delay requested by Special Hobby will allow to release the book in six months, hopefully. The author Gérard Bousquet is again able to work (more or less), he will sort the photos by chapters and give the corresponding caption. For sure, the photos will be sent to SH in order to allow them to work on the kit. Last news : the book should be under responsability of Artipresse, and some milestones might slip.